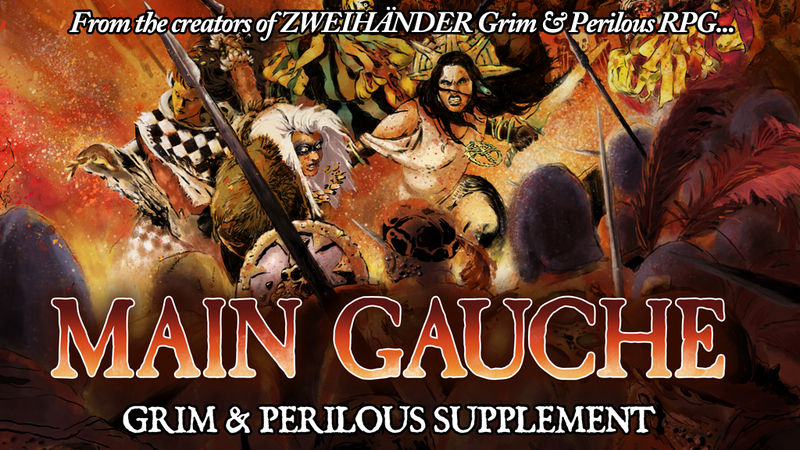 MAIN GAUCHE Kickstarter is now live! Plugging into the core D100 ZWEIHÄNDER experience, this book expands your gaming options into the realms of chaos and beyond. MAIN GAUCHE is suited for running low & dark fantasy games, along with Renaissance and medieval-style adventures. You can also use this book to create your own homebrewed worlds, whether inspired by the works of Andrzej Sapkowski, George R.R. Martin, Glen Cook, Graeme Davis, Robert E. Howard, Scott Lynch, or other ‘grimdark’ media. With over 180 Professions and 300+ spells across ZWEIHÄNDER & MAIN GAUCHE, you now have countless ways to create your own vision of grim characters ready to embark upon perilous adventures. Embrace the left-handed path of MAIN GAUCHE on Kickstarter, where chaos awaits!